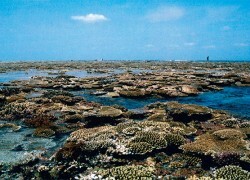 Located in the northern part of Miyako Island, Yabiji is the largest grouping of coral reefs in Japan. These 100 or so coral reefs are famous for being visible above the water line during the lowest tide of the year. Yabiji is also known for its diving and snorkeling spots, only a 30-minute boat ride from Ikema Island, which is also connected to Miyako Island by the Ikema Bridge.